Epta constantly invests in the development of new technologies aimed at increasing the quality and reliability of the products that bear the MISA brand, while fully respecting the environment. MISA cold rooms are made using patented technologies and solutions. This is a demonstration of the company’s commitment to providing its clientele not only with excellent products, but also with solutions that can become superb investments for their durability, flexibility of use and total reliability. It is precisely thanks to its numerous patented technologies that the MISA panel is unique on the market, because it is perfectly modular, offers high energy saving, is eco-friendly, non-toxic, and plasticised for perfect thermal insulation. The FAST-FIT centring system allows the panels to be perfectly aligned. 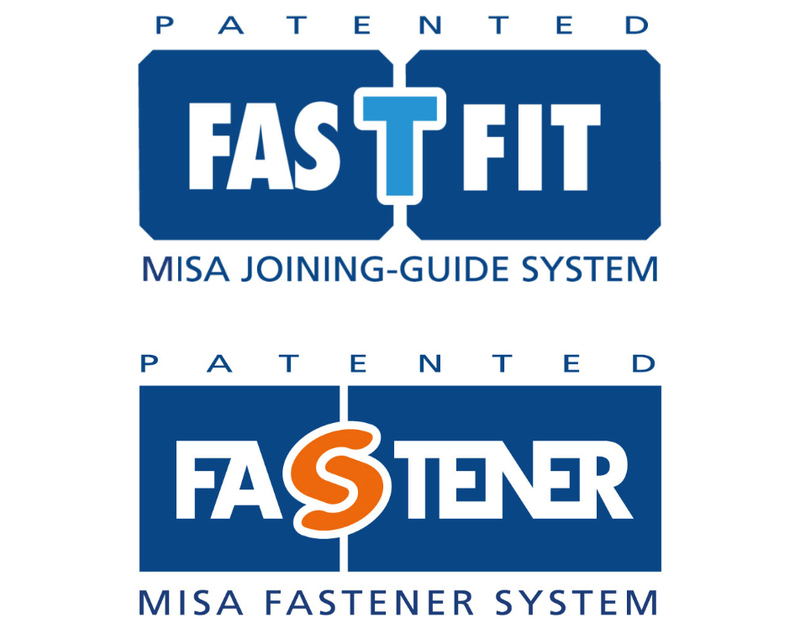 The FASTENER system, on the other hand, is a patented coupling device, made from non-deformable composite materials that guarantee durability over time, even in the event of several assembly and disassembly operations. The Fast-Fit and Fastener systems work in synergy so that the panels can be assembled rapidly and perfectly in terms of alignment and thermal insulation. MISA technology works to reduce the thickness of the panels without compromising high insulation standards. Having a thinner panel actually means reducing energy consumption and consequently reducing the environmental impact. MISA has therefore reduced the foam material present inside the panels, improving its insulating capacity thanks to the MVS – Misa Vacuum System technology: an ultra-modern installation capable of producing 115,000 isothermal panels each year with polyurethane vacuum injection, fundamental for guaranteeing the constant high quality of the product and the consequent improvement of all the physical and mechanical characteristics of the isothermal panels. What improvements are attained injecting polyurethane with the MVS system? Adherence of the foam to the plate, a high degree of homogeneity, good resistance to compression, and a perfectly flat panel surface. The improvement from MVS technology also involves the hygienic-ecological aspect. In fact, the work environment is kept perfectly clean thanks to the elimination of the polyurethane leaks that are normally present in panels treated with traditional systems, and the absence of volatile substances generated during the foam expansion phase. 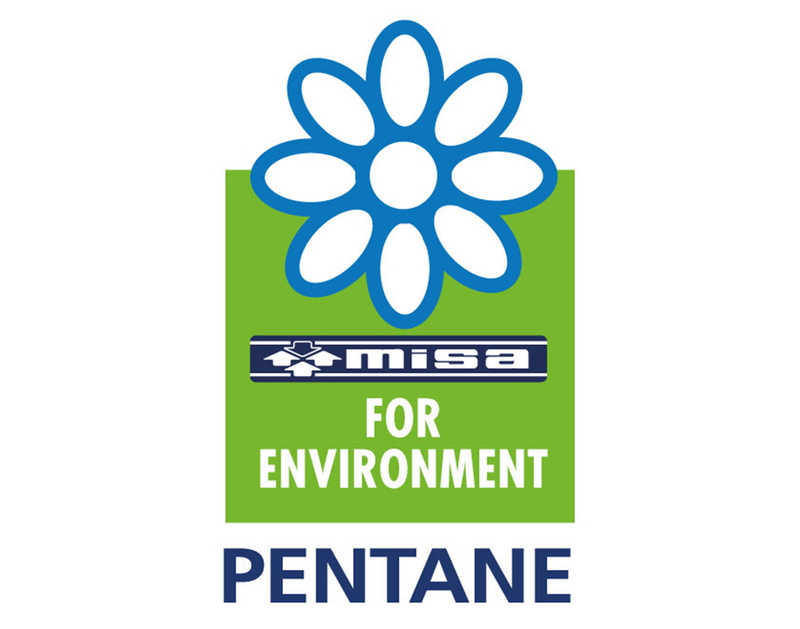 Misa uses exclusively pentane, a modern and ecological expanding agent whose easily degradable molecule produces no polluting effects, in conformity with European standards and the Kyoto Protocol. The introduction of PENTANE has led to further improvement in the quality of the panels, which, in the wake of multiple checks carried out since 2002, now reveals a series of advantages. The adhesion of the foam to the plate has reached extremely high values (sometimes higher than 200kpa) so that the average values are in the 140-150 kpa range. The cellular structure of the foam is extremely fine , paired with its optimum adhesion to the plates, the thermal conductivity, while initially a little higher than that of panels expanded with HCFC or HCF, is maintained absolutely constant over time. Therefore panels expanded with PENTANE ensure better thermal insulation. Workrooms or processing environments of products for fishing. The MISA panel, made with the combined use of steel and non-toxic PVC, guarantees stability, durability and the greatest ease of cleaning; it ensures perfect hygiene because it neither retains nor absorbs liquids and odours. Hence, it is a perfectly suitable and certified surface for processing and preserving fresh food. The panel appears bright, with an impeccable finish and perfectly flat surfaces. The laminated panel, obviously, does not undergo painting, making it unique among its kind on the market. The high thermal insulation standards of the MISA panel are also achieved through the application of DOW Pascal™ Pro technology, which allows high reactivity thanks to the extremely fine cellular structure of the foam injected into the panel for a significant improvement in the degree of thermal insulation. The combination of Misa panels with the Pascal™ system leads to an 11% increase in the thermal insulating power of a cold room. is the formula known by industry experts that identifies the high degree of thermal insulation and hence of energy saving.